Let’s face it: Having to fundraise stinks. And traditional fundraising programs like cookie dough, popcorn, and gift wrap don’t make it any easier. That’s why we’re revolutionizing the way group’s fundraise. Gives 50% profit back to your organization. You heard us right, half! Has no order minimums or inventory requirements. That’s ZERO risk to you! Offers fast-selling, Apple-Certified and Android tech accessories that people want. Ships orders quickly so you can get the goods in the hands of your donors…fast! Provides cool incentive prize programs that drive student participation. Cut your diet of food-based fundraisers. Come learn what we’re all about: Your organization’s bank account will be glad you did! Our Program is Making Waves. If you are raising funds for your school, church, youth group, athletic team, or charitable organization, then our Fundraising Program is the proven choice to help you reach your financial goals. Students sell through a simple catalog of today’s hottest, high-quality tech accessories. Selling brochures and order forms are provided free of charge. Items are priced at or below normal retail prices. Product sorting is available for quicker order distribution. Best of all, kids love it because kids love tech! For more information about our Fundraising Program, ask your Smartcell Rep, or fill out the form below to learn more. Please be sure to visit our page, How It Works. Our fundraising catalog and prize program forms will be mailed to you to hand out to your students. Spread the word and start fundraising! Set a time frame for students to generate orders, collect payments, and turn in their forms to you. Tally your student’s orders, and send the sales figures to us using our Order Submission Form. We turn around and send you an invoice for payment. Once the invoice is paid, orders are shipped within 2 weeks (tracking numbers provided promptly). After receiving your order, double-check against your packing slip for accuracy (before distribution!) and then distribute to your students. Presorted: ALL ORDERS are presorted by student. Free Shipping: We provide free shipping for total orders of 100pcs or more. Orders of less than 100pcs will be charged a S&H fee of up to $50. We really strive to make this an awesome fundraising experience for you, your participants, and the donors. Check out our page, Downloads & FAQs, for our brochure info and common questions about our program. You can review more information about our fundraising programs below. Stuck on which prize program works best for your school? We recommend the Carnival Prize Program for grades K-5, and the Tech Prize Program for grades 6-12. However, you are free to choose which fundraiser is right for your group. 1. What is your payment address? 2. How long does it take to receive my order? How can I track my order? In most cases, orders are shipped via UPS within 2 weeks of receiving payment. You will receive order details and tracking information via email once your items ship. 3. Is there a minimum order? Although other fundraising programs enforce minimums, we do not. There are no minimum orders we expect when you run our fundraiser, but please remember that we have shipping and presorting options available at 100+ piece and 300+ piece shipments, respectively. I received my order. What should I do next? PLEASE DO NOT THROW AWAY YOUR PACKING SLIPS! Verify that your packing slip matches the items that were shipped to you. Do this BEFORE distribution of items to your students. If there is a discrepancy, please make note of what you received. Then contact your Smartcell Fundraising Rep to report the discrepancy, and we will work with you to get the matter resolved. All right. What gives? How are you able to give back 50% profit while keeping your prices so low AND delivering quality products? Yeah, we know. We’re pretty awesome. Actually, we work closely with all of our manufacturers. We are able to cut out the “middle-man” and pass the savings along to the school/organization and to the donor. It’s a win-win. Rest assured our items are backed with a 90 day warranty against manufacturing and product defects. 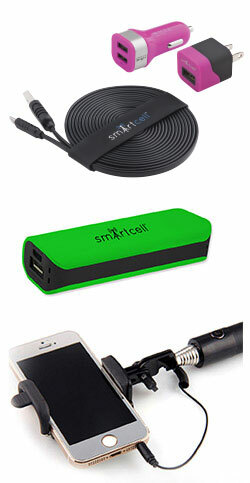 Contact us at orders@smartcellgear.com or speak to your Fundraising Rep.
Want to raise money for your school/organization? Enter your info below & we will contact you.